John Muir walked into the woods with not much more than a journal, some flour in a sack and a pair of boots. He would disappear into the wilds, exploring, making notes, making weird breads out of plants and the flour he brought, drinking from mountain streams, making house calls on lonely woodsmen. These days he makes a decent tomato sauce. * The appeal of Muir’s adventures has not diminished with time. Every REI, Hudson Trail Outfitters and Patagonia advertisement calls upon his sense of the world: shedding the chains of urban or suburban life, forging a simple, if temporary life in the woods and wilds of the country. Back before celebrity scents, Abercombie sold useful things, like tents. 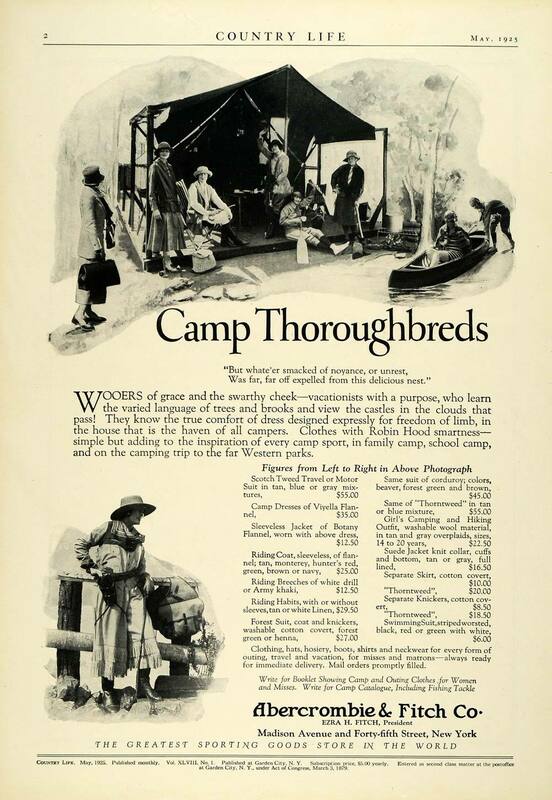 This ad is from 1925. Can you imagine buying an Everest worthy silk tent at Abercrombie today? At the turn of the last century, the basement of Abercrombie’s flagship store had a shooting range to try out the latest hunting rifles. Americans have always loved the concept of roughing it. Most of us just don’t have the time. There are other concerns as well. Lack of comfort, lack of know-how, lack of equipment. Backpacking is a time and potentially equipment intensive sport, and many of us have enough expensive hobbies already. It’s time intensive: planning, driving to a hiking spot, spending hours cruising through the woods to get to your camping spot, doing it all again the next day. Long trips require more planning, from meals, to supply drop points, to potential bail points. Weeks of planning cannot control the weather, which can dump rain, extreme heat or snow, depending on the season. A preplanned trip can lead to misery, as tents fail to dry out, blisters form, snakes consume fellow hikers, etc. John’s Gunnar road bike. Not a sport touring bike.. this thing has a carbon front fork and tiny tires. He has standard road gearing, not even a compact up front. If the road gets to steep, you can walk, no big deal. 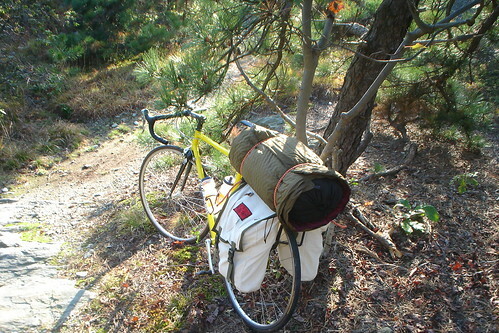 Those panniers were homemade (by the Author’s wife) for less than 15 bucks. The huge roll up top is a car camping sleeping mat and a big ole tent. Perfect example of making due. You’re thinking: man, I am not a tourist, I don’t have a touring bike or all that kit. Well you might, actually have most of it. It’s just overnight. 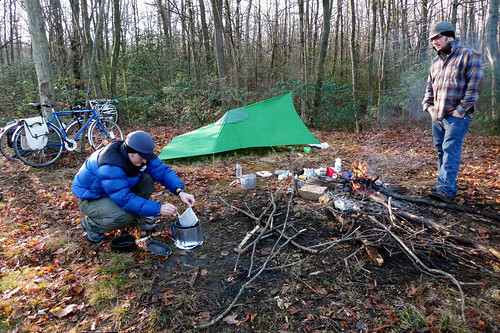 You don’t need advanced equipment, a stove, a titanium spork or a even a tent. You just need a few basics. A tent is fine, but a tarp works just fine. A blue 8×10 tarp and some twine will keep you dry even in a nasty downpour. That green thing in the picture above is just a tarp, pitched like a tent. Blue tarps are under 10 bucks in the size you would need. Most summer sleeping can be handled by a cheap foam mat and a fleece blanket. You don’t even need the mat if you find a cushy place to sleep, like on moss, or if you make a pile of leaves. So the three most expensive things, really, can be replaced by stuff you already have or can get for less than twenty five dollars, total. You can bring a stove and cook, but really, just cook over the fire. Bring something to shove on a stick, some snacks, and you are set. Because it’s just an overnight, if you forget something major, it’s not a big deal. Even if you forget food, you’ll live till you get home. No, its not the first episode of Twin Peaks. That’s Big John snoozing under a tarp. There are plenty of places locally to get your s240 fix. Gambrill, Greenbrier, and Cunningham Falls State Park all have inexpensive camping, with showers, water supplies and bathrooms. They are all a pretty easy ride from Frederick. Cunningham Falls and Greenbrier both have swimming, which is rad. There is free camping too. A bit of a ride, but totally doable: head up to Michaux State Forest which is just above the PA line above Emitsburg. Camping here is free, you just plop down in the woods where ever looks enticing. This is real woods camping, no amenities, no water, etc. Go prepared. Slightly less rustic, but just as free, is camping along the C and O canal. The canal is littered with decent camping spots, all of which have water pumps and porta johns, and is a pretty easy ride from Frederick to access. I personally really like the area between Harpers Ferry and Hancock, which is scenic and has some great sleep spots. 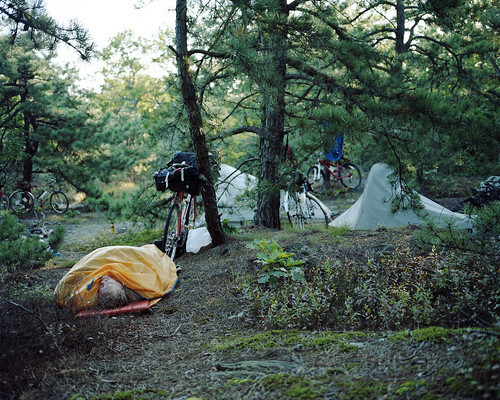 If you want to know more about bike camping, what you need and don’t need, stop by the shop and we can chat about it. If you want to go full hog, and get some dorky backpacking kit, we love that stuff and can either source it or point the way to it. We have a great selection of panniers, racks, and all that. Again you don’t need that stuff, but if you get into it, life gets marginally easier with it’s use. If there is more interest in the topic, I can write about how to make some kit, but, probably there won’t be, so consider this the final word! *That’s a joke, I know he really runs Ken Burns’ Civil War themed Laundromat. It’s a huge summer o’ shop rides! Sunday Mornings: THIS WEEK’S WOMEN’S RIDE IS CANCELED BUT WE WILL BE BACK NEXT SUNDAY! Women’s beginner road rides from the Starbucks in the Westview Shopping center. 8AM 12-18 miles on low traffic roads. Rides will be led by Tracy, who works here, and know the roads well, and all that good stuff.